South Africans showed up in droves to mourn Winnie Madikizela-Mandela, an anti-apartheid icon and controversial figure, at her funeral service Saturday. The wife of civil rights leader Nelson Mandela, known for her own activist role, died on April 2 at age 81, at a hospital in Johannesburg where she was being treated for a kidney infection. Tens of thousands of people filled Soweto’s Orlando stadium for her service, and people shouted phrases like “Long live Comrade Winnie”, “the struggle continues” and “power to the people,” the Guardian reported. “Today we lay to rest our heroine, a struggle stalwart and mother-to-the-nation,” the South African government tweeted Saturday. South African President Cyril Ramaphosa said Madikizela-Mandela was “an African woman who — in her attitude, her words and her actions — defied the very premise of apartheid ideology and male superiority,” in his eulogy. Ramaphosa described her as “an advocate for the dispossessed and the marginalized” and “a voice for the voiceless,” in her work as a parliament member in a CNN report. 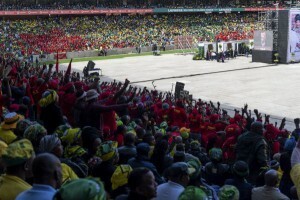 The crowd ranged from African National Congress members, to the Economic Freedom Fighters populist opposition party, to political and cultural celebrities and other supporters around the world. Amidst the prayers, dancing, tributes and anthems, there was some tension with applause for those who voiced resentment of those in the crowd who didn’t stand by her as a controversial figure. “If it is true that the ANC honors Winnie Mandela, name the Cape Town airport Winnie Mandela Airport,” Malema continued, with applause from the crowd. Madikizela-Mandela, sparked widespread controversy in 1986, when she seemed to endorse ‘necklace’ murders, in which victims are burned to death with gasoline-soaked tires around their necks, as a means to achieve black liberation in South Africa. “Hand-in-hand, with our matches and our necklaces, we shall liberate this country,” she told a crowd in April that year. Her husband, Nelson Mandela, was serving out a 27-year sentence on charges of treason at the time. Madikizela-Mandela campaigned for his release and was placed under house arrest. She was also detained in solitary confinement for 18 months for anti-apartheid activities. In 1990, when her husband was released from prison the couple walked hand in hand with their free hands in clenched fists. The end of white minority rule came in 1994 with her husband’s election as president and her serving as South Africa’s first lady. Madikizela-Mandela faced more controversy at the end of apartheid since she didn’t appear to show remorse for abduction and murders carried out in her name. She was later elected to South Africa’s Parliament, but her image was blemished by the scandals. The Mandelas separated in 1992 and divorced in 1996 with Mandela accusing her of infidelity. But her appeal remained strong, and she served as an ANC parliament member since 2009. “Let us honour[sic] her memory by pledging here that we will not betray the trust of her people, we will not squander or steal their resources, and that we will serve them diligently and selflessly,” Ramaphosa tweeted on Saturday.